The first is Glow Recipe Watermelon Glow Sleeping Mask, which was on my wish list for a while before I received it for my birthday and the second is Omorovicza Midnight Radiance Mask, which I was kindly sent and was very excited to try as Omorovicza is one of my favourite skincare brands. Glow Recipe is a Korean skincare brand that is vegan and cruelty free. This is the first product that I have tried from the brand but I know that it won't be the last. The mask is formulated with fruit enzymes, glycolic, lactic and hyaluronic acids. 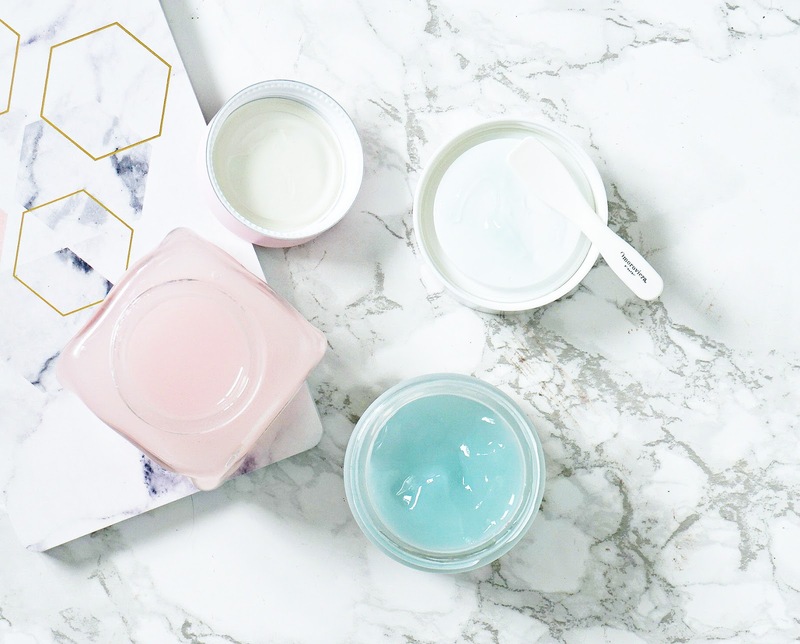 It is quite watery in texture, which means that application can be a little messy and great care needs to be taken when opening the jar so you don't lose precious product. This mask is pink in colour and smells of watermelon (not too much of a shocker, given its name!) and once applied, feels very light on the skin - refreshing even. This is applied as a last step in my evening skincare routine and the AHAs get to work on any dead skin cells, whilst the watermelon extract soothes the skin and hyaluronic acid plumps the skin - the result is that I wake to fresh, soft, smooth and glowing skin! I am completely hooked on this mask! My skin is very used to acids, however if you are interested in trying this mask and are new to acids or have particularly sensitive skin, you can use this as a 10 minute quick fix initially and build up to using overnight. Now on to Omorovicza Midnight Radiance Mask. This mask also uses an acid, but in this case its Salicylic Acid, which is generally used for fighting acne, however it is not just spot-fighting it deeply cleanses the skin; dissolving blackheads, exfoliates and reduces inflammation. On it's own, it would probably not be the best for my dry skin, but this mask also contains Red Alga and and Sodium Hyaluronate, both of which help to lock moisture into the skin. Another key ingredient is Sand Lily, which reduces the size of dark spots - particularly helpful if you have some stubborn hyper-pigmentation, like I do. The mask is applied after cleansing and toning at night. It has a jelly-like texture yet it isn't as runny as the Glow Recipe mask. I wouldn't describe it as sticky, however it does feel slightly tacky on the skin - I don't feel like my hair will cling to my face or that my face will stick to the pillow but if I touch my face, I can feel it there, which I assume is down to the gel texture. The morning after using this mask, my skin looks so fresh, bright, smooth and glowing with refined pores. I have been using twice weekly for the past 3 weeks and my skin is loving it. I will keep you posted on how it works for my area of stubborn pigmentation but I have high hopes for it. 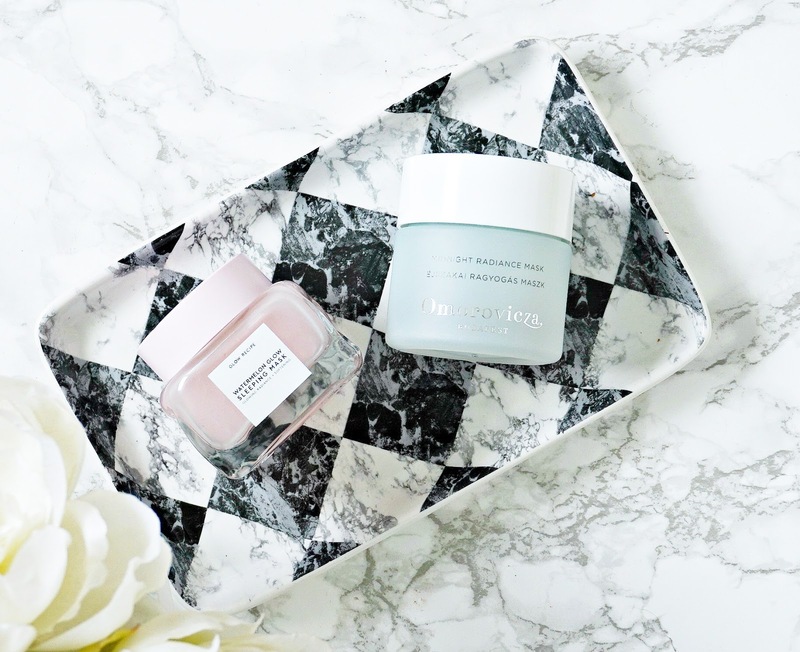 Have you tried either of these masks? I would love to hear what your favourite overnight masks are? All products are bought by me, unless otherwise stated. The Omorovicza mask was kindly sent to me. Opinion is always my own.